It's no secret that the ladies of On Crawford St. love brunch. Naturally, we spend most of our Saturday and Sunday mornings roaming the streets of Toronto looking for the best places to brunch. 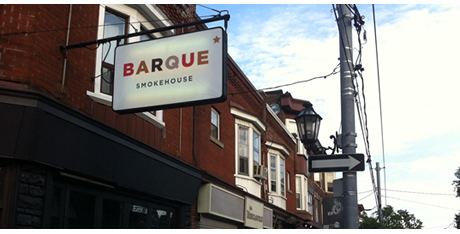 On Sunday, J and I headed to Barque Smokehouse on Roncesvalles. Having been there for dinner, we'd been eager to try their brunch menu for some time. The atmosphere at Barque was comfortable and homey. It was also very kid-friendly, with cartoons playing on the TV, making it a perfect fit for the Roncy hood. 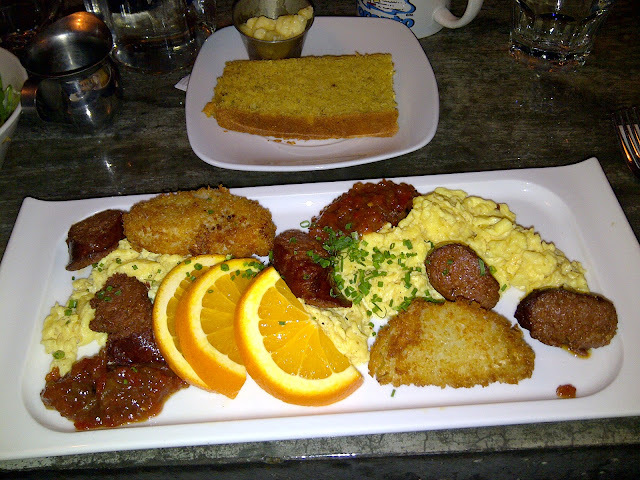 Barque's brunch menu, although not extensive, certainly does not disappoint. Upon first glance, I was torn between the Barque Benedict and the Pancakes. I decided on the latter, as I've heard repeatedly that Barque’s pancakes are the best in the city. Let me just say that these are not your average pancakes! 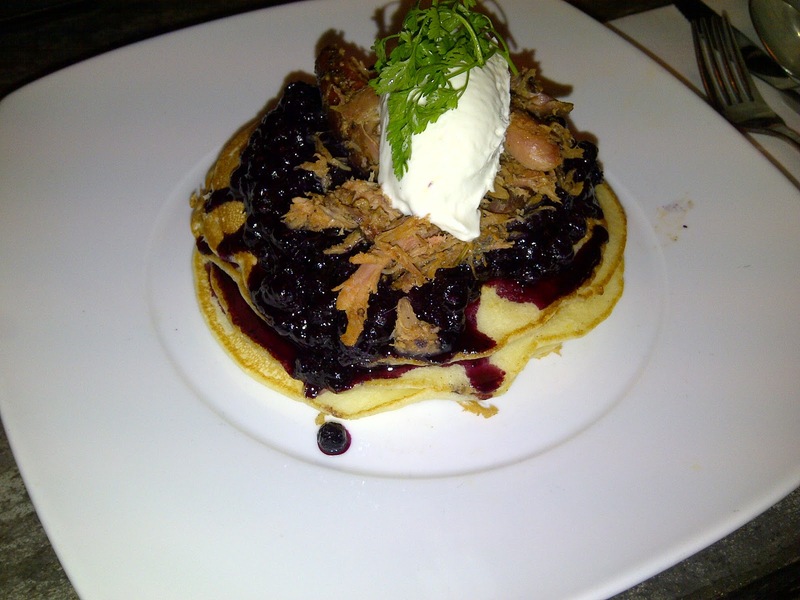 The pancakes were light and fluffy, covered with a blueberry compote that struck a tasty balance between sweet and sour, duck that was smoked to perfection and topped with chèvre. J’s Scrambled Eggs were soft and creamy in texture. The Merguez sausage that accompanied them provided just the right amount of kick to spice up the delicate flavour of the eggs. This dish was also served with fried green tomatoes – an obvious ode to Barque’s Southern style - and a tomato salsa. J opted for a side of corn bread, which was moist and slightly sweet. Barque’s brunch is the perfect way to spend a leisurely weekend morning and well worth the inevitable line-ups.